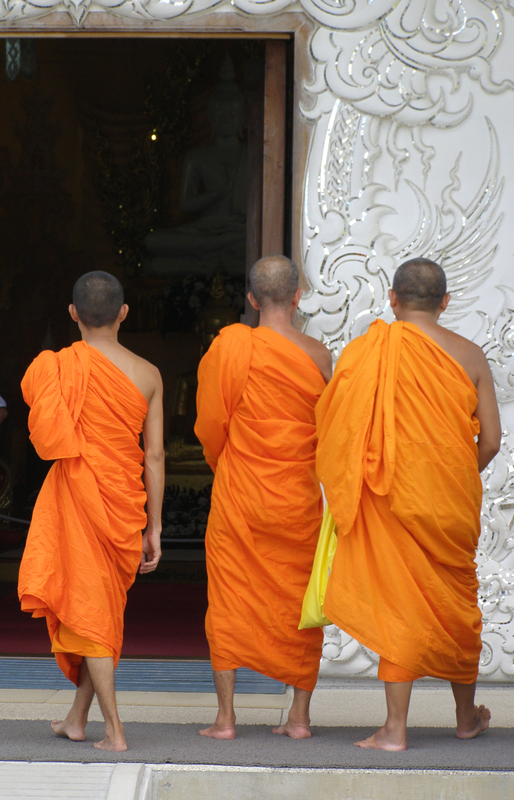 Thailand, like many parts of Asia, is all about temples. 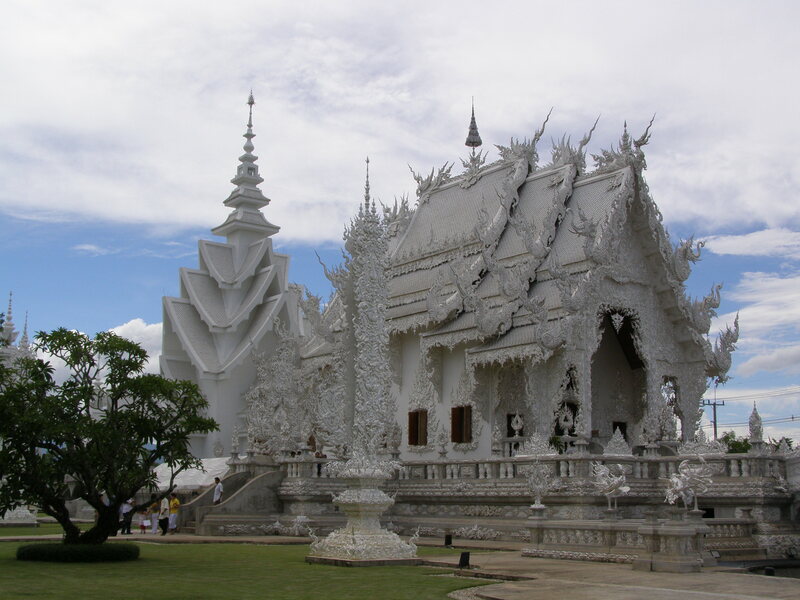 But Thailand is also home to the most fantastic temple I’ve ever seen: Wat Rong Khun or the “white temple”. A work in progress since 1996, this ornate Buddhist temple near Chiang Rai in northern Thailand is privately owned by artist Ajarn Chalermchai Kositpipat and is as amazing and fantastical inside as it is outside. Sadly, the temple was badly damaged in a 6.3 magnitude earthquake last year and parts of it remain closed to the public. I saw it – and took this photographs – in 2007. 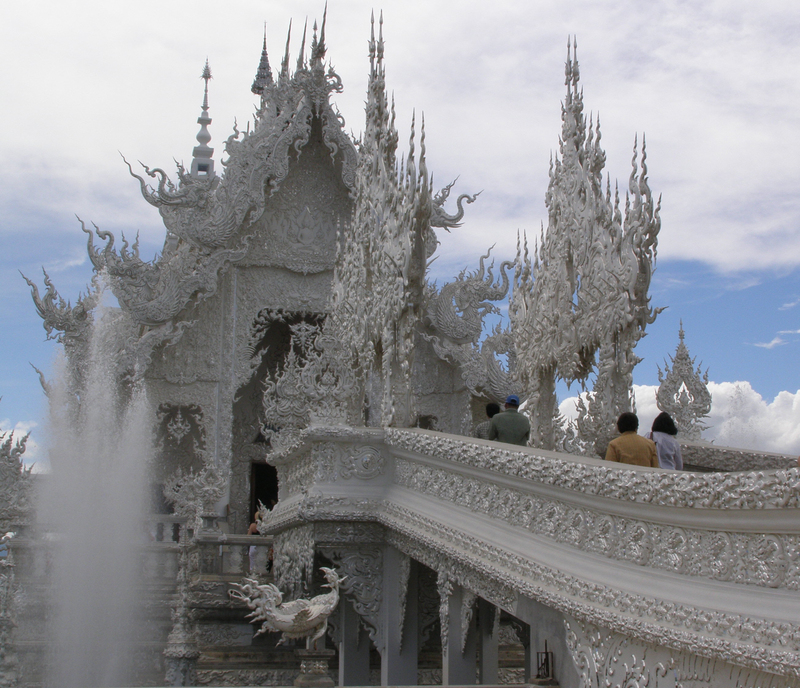 By then, Ajarn Chalermchai Kositpipat was a decade into the rebuilding of a new temple to replace the original Wat Rong Khun, which had fallen into disrepair. For Kositpipat, the temple is an offering to Lord Buddha; one he believes will give him immortal life. From the outside, the temple is exquisitely beautiful. But some parts of the temple, and its artwork, are confronting. The main building, the ubosot, looks like a classic Thai temple, except that it is covered in fragments of mirrors. Inside, the walls are a riot of colour, covered in murals that depict weird and wonderful images including orange flames, the World Trade Centre terrorist attack, alien invasions, petrol pumps and sharks (to name just a few). Demons are painted alongside Western faces, including Michael Jackson and Harry Potter. Since the earthquake, entry to this building is no longer allowed. To reach the ubosot, you must cross the bridge of “the cycle of rebirth”, over a small lake. I loved the sweeping lines of this bridge, which teaches that the way to happiness by is by resisting temptation, greed, and desire. In front of the bridge are hundreds of outreaching hands that symbolise unrestrained desire. I saw these as hands reaching from Hell. After crossing the bridge, the visitor arrives at the “gate of heaven”, guarded by two creatures representing Death and Rahu, who decides the fate of the dead. When completed, the temple compound will have nine buildings, including the ubosot, a hall of relics, a meditation hall, an art gallery, and living quarters for monks. 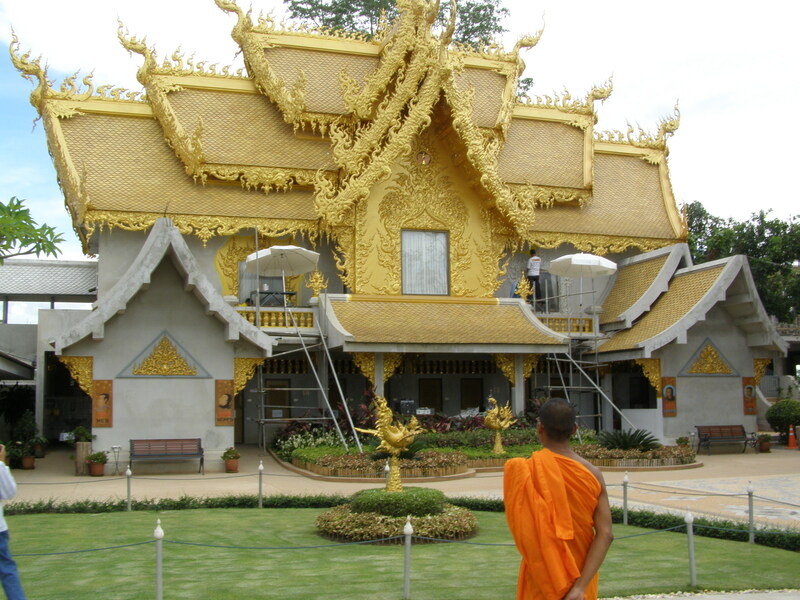 Apart from the orange-clad monks, there is some colour in the temple compound in the form of an ornate gold building (which houses the restrooms), signifying the body rather than the mind. After the earthquake, Ajarn Chalermchai announced that he would devote his life to restoring the temple to its original beauty. I hope one day I’ll see it again. This blog post was inspired by the travel theme Fantastic from Where’s My Backpack? 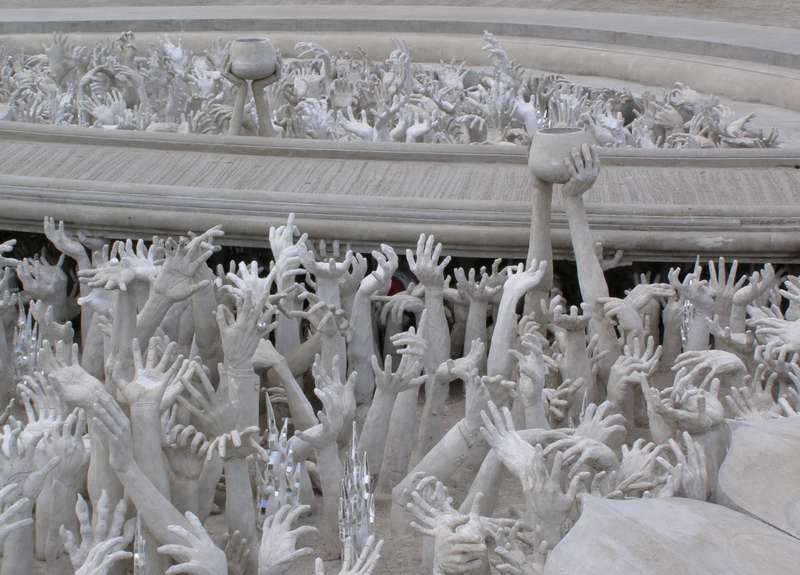 I think Wat Rong Khun fits the bill perfectly. A Glass Half Full travelled to Thailand (on that occasion) as a guest of the Thai Tourism Authority. Exactly. It’s a combination of something really beautiful, and kinda creepy. Definitely from a fairytale, but some of them are a bit grim too (pardon the pun). Wonderful and informative, A Glass Half Full.